High Quality Content by WIKIPEDIA articles! The Planetary Data System (PDS) is a distributed data system that NASA uses to archive data collected by Solar System robotic missions and ground-based support data associated with those missions. 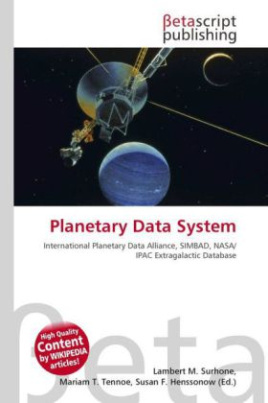 PDS is managed by NASA Headquarters' Planetary Sciences Division. The PDS is an active archive that makes available well documented, peer reviewed data to the research community. The archive and data within are held to high quality standards established by the PDS. The PDS is divided into a number of science discipline "nodes" which are individually curated by planetary scientists. The Solar System Exploration Data Services Office at the Goddard Space Flight Center handles PDS Project Management.